Joe Hoover is a former highly trained and decorated Air Force combat cameraman who was caught up in the midst of the early Vietnam conflict for nearly three years. Then, as a Cinematographer at Lookout Mountain, Hollywood, California, he filmed "There is a Way," nominated for "Best Documentary Film" at Cannes Film Festival, and shared the Cleveland Film Festival's "Cris Award" for that avant-garde film. Joe filmed the first national TV commercials for Red Lobster, Circus World, and Funstuff Toys. He wrote and produced corporate promotional films for National Airlines, Palm Beach County Development Commission, Southern Bell, and PepsiCo. He produced the highly acclaimed training film, "Prevention of Drowning," for the U.S. Army. Of 36 entries, his "Air Gator" was judged, "Best Sales Film of '73" by Bohn Benton AV, New York. He produced featured film segments for early live INTELSAT uplinks from Walt Disney World, Epcot, Kennedy Space Center, and Sea World for Italian National Television. As Director of Corporate Communications for The Satellite Group and Producer for The Global Network, he planned and helped implement one of the world's first major multi-national financial satellite teleconferences. He directed "Whiz, The Elf Who Made Christmas Special," a prime time TV special, sponsored by Sears, and syndicated in 122 top-rated markets. He filmed the first series of national TV spots for Sears Termite & Pest Control. He won two consecutive "Best of Show" ADDY's for his Southern Ballet Theater television public service announcements. Joe produced and marketed in 32 markets a series of television commercials for Professional Investigators. He co-authored "Secrets of Top Private Eyes," with Anni Adkins, an in-depth PI training course. 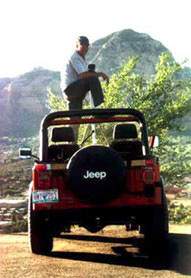 Joe has authored two novels, "The Preachers Kid," and "Jehovahs Windfall." His photographic images compliment artist Anni Adkins' oil paintings. Joe Hoover is currently working on an image video and compiling a third literary work, "The Photographer, the Painter, the Romance." Read the article by Philip Golabuk about Joe Hoover's and Anni Adkins' first art show together, The Photographer, the Painter, the Romance."